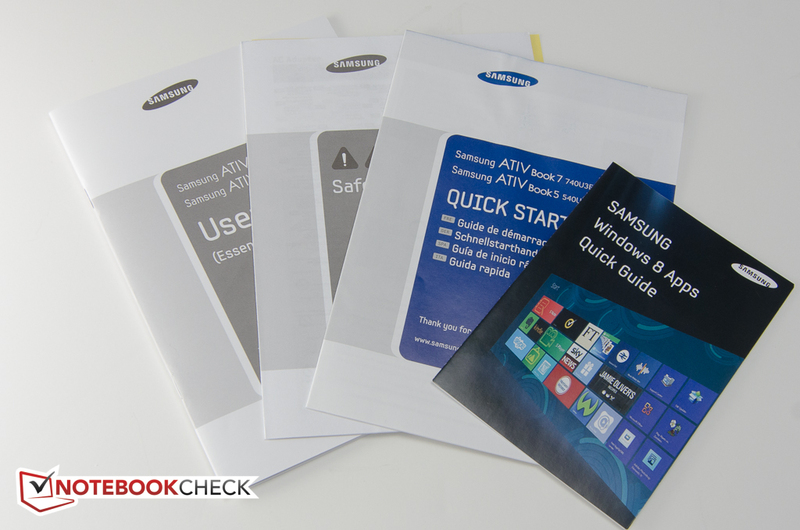 Earlier this year, Samsung decided to consolidate all of their Windows-based systems under the "Ativ" brand name. 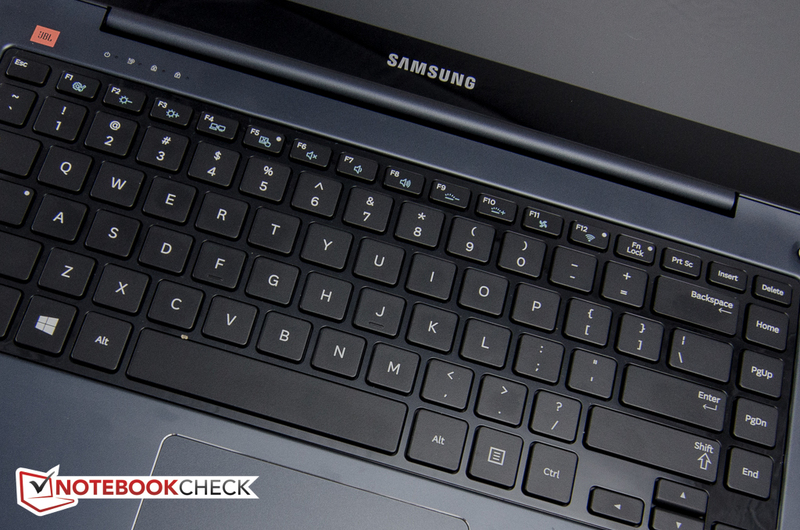 In March we reviewed the mid-range Samsung Series 5 530U4E-S02DE Ultrabook, which came equipped with the same Intel Core i5-3337U 1.8 GHz CPU as our review candidate this time, a matte 14-inch screen, and a dedicated AMD Radeon HD 8750M. 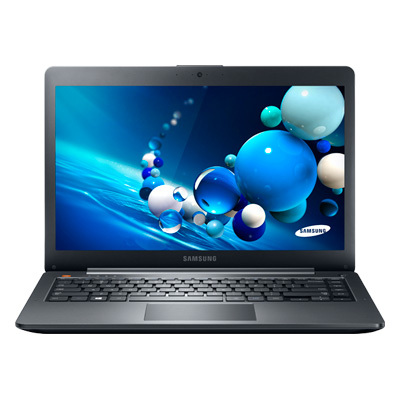 The Samsung Ativ Book 5 adds a 1366 x 768 glossy touchscreen, but forgoes the dedicated GPU in favor of the integrated Intel HD 4000. 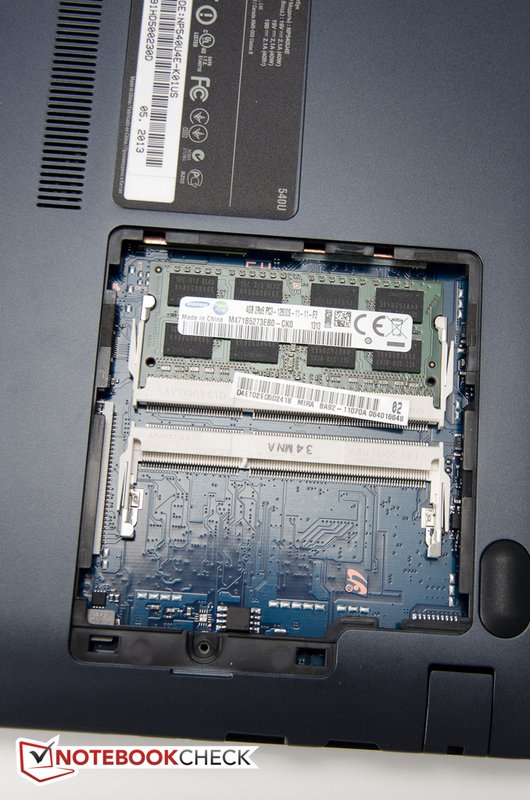 4 GB of single-channel RAM and a 500 GB hybrid hard drive round out the package. With its matte brushed finish - Samsung calls it "Mineral Ash Black" on their website, although it looks more bluish to us - the aluminum metal and fiber glass casing remains unchanged from the previously reviewed non-touch Series 5 Ultrabook. The chassis is stiff, resists twisting well and flexes hardly at all when pressure is applied. The lid is torsionally less rigid, but still sturdy enough. While unassuming, the Ultrabook does nonetheless look quite upscale and stands out from the sea of less expensive, all-plastic slim-and-lights. While larger 15.6-inch Ultrabooks seem to be gaining in popularity, we appreciate this 14-inch system and its modest dimensions of 388 x 234 x 20.8 mm. Combined with a reasonable weight of 1.96 kg - almost identical to the Lenovo IdeaPad U410's 1.98 kg - the Ultrabook is easy to slip even into smaller bags and easy to carry. 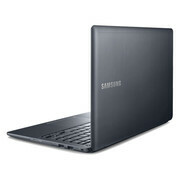 For additional details, please check our review of the Samsung Series 5 530U4E-S02DE Ultrabook. 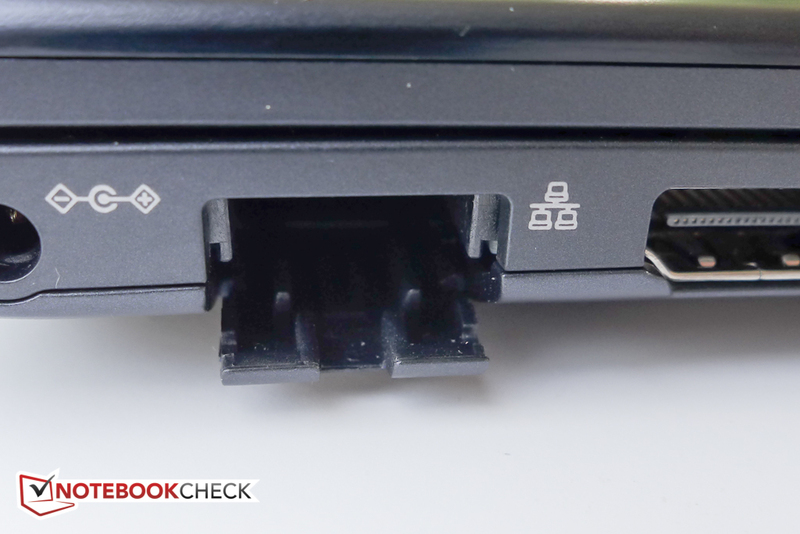 As typical for most slim-and-light systems, the connectivity options aren't overly generous, although all important ports are included. 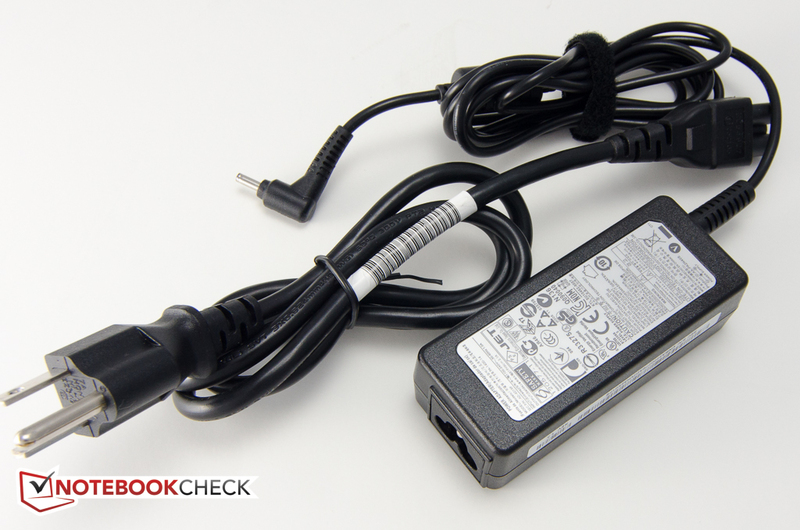 While the Samsung Ativ Book 5 includes dual video-outs, it's worth mentioning that the use of the mini VGA port requires a special 12-pin to VGA adapter dongle, which can be purchased separately for $40. 3 USB ports - only one confirming to the faster USB 3.0 standard - are par for the course, as are the SD card slot, HDMI, and RJ-45 ports. 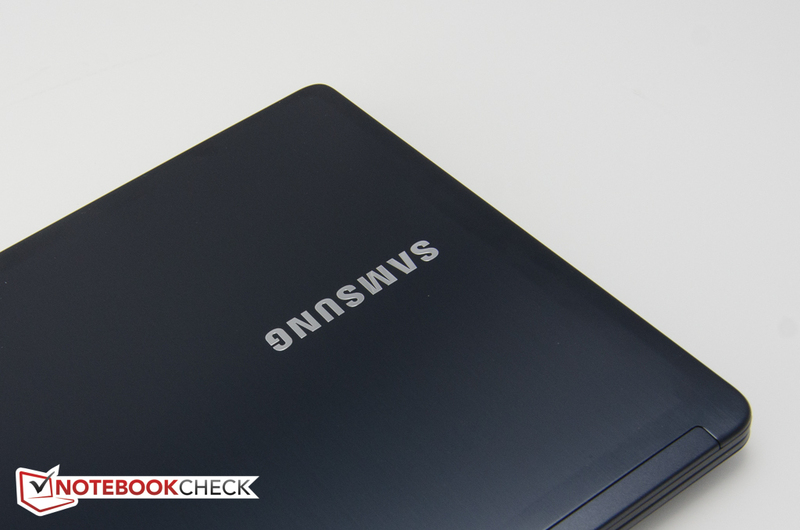 Samsung deserves credit for the port placement, as all important ports are located behind the mid-line on either side of the notebook. Plugging in USB devices, the HDMI cable, or a network cable thus does not crowd the workspace or interfere with the operation of an external mouse. WLAN is provided by the Qualcomm Atheros AR9485WB-EG Wireless Network Adapter, which not only supports 802.11 b/g/n, but also Bluetooth 4.0. Although the 1x1 single-band card is only capable of a theoretical transfer rate of 150 mbps, its throughput should nonetheless be sufficient for most users. We ran into no connectivity issues during our time with the Ultrabook. Samsung includes only the power adapter, power cable, and various pamphlets. The single hatch on the bottom only provides access to the two system RAM slots. A 4 GB module is installed; according to Samsung, the Ultrabook will accommodate a maximum of 16 GB DDR3 RAM (1600 MHz) in a 2x 8 GB configuration. Neither the hard drive nor the fan are accessible without dismantling the system. 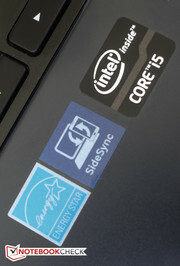 Please check the corresponding section in our review of the Series 5 Ultrabook for more details. 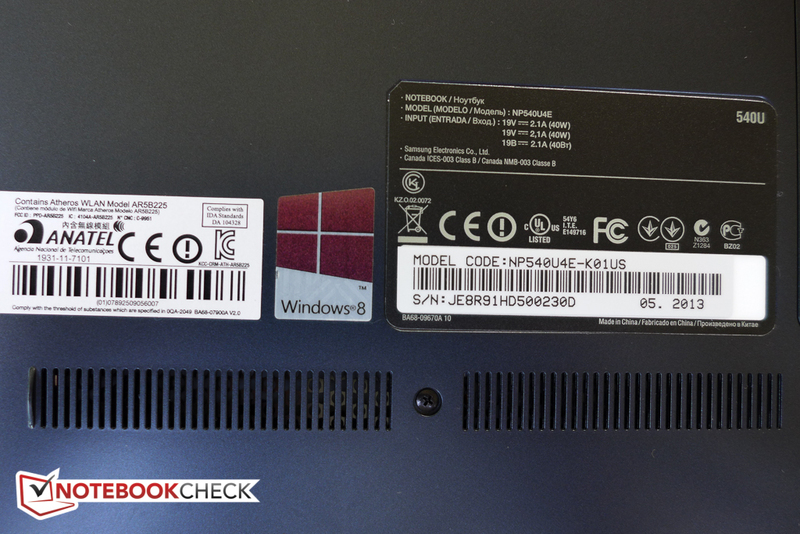 In the US, the Ativ Book 5 Ultrabook is covered with a 12 month standard parts and labor warranty. Upon registering, Samsung provides three additional months of warranty free of charge. The chiclet-style keyboard, which sits suspended in a glossy black plastic insert, features adequately sized 15 x 15 mm keys with a matte finish and decent travel. Feedback is better than expected and typing is generally a comfortable experience, which should even satisfy touch typists. 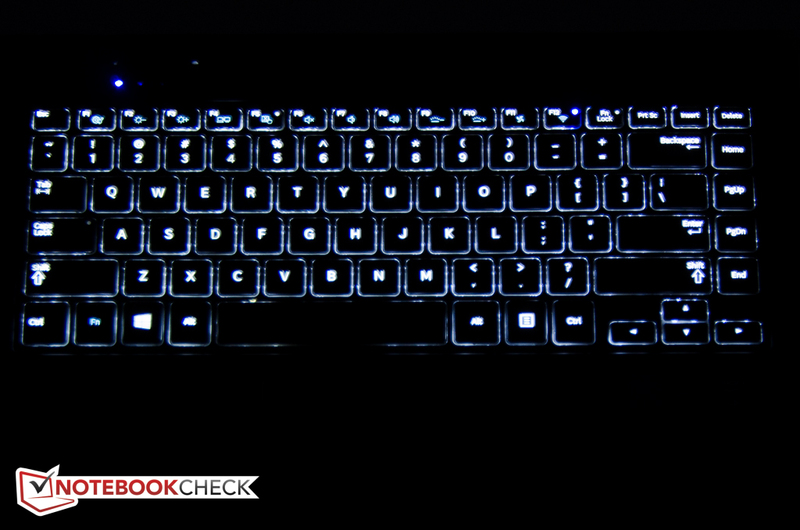 The keyboard's backlight features four adjustment levels, although even the highest level is quite dim compared to other systems. 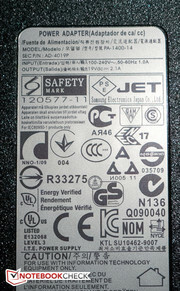 The large touchpad is made by Elan and measures 130 x 68 mm. The Smart-Pad, which lacks dedicated left and right mouse buttons, supports multi-touch and also Windows 8 swipe gestures, which are executed from the edges. We had no issues with two-finger scrolling, zooming, or calling up the charms bar. 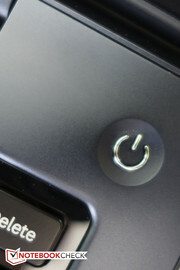 The surface of the touchpad is slightly recessed, smooth to the touch, and allows fingers to glide easily. Left and right mouse clicks are shallow in travel, but the feedback is very distinct and audible. The capacitive touchscreen recognizes up to 10 fingers simultaneously. During our test, the screen reliably translated our inputs without any noticeable lag or other issues. Samsung utilizes a glossy TN panel made by AOU. The 14-inch edge-to-edge glass display offers a pretty standard native resolution of 1366x768 pixels and is very dim at only about 153 cd/m² average across all quadrants. 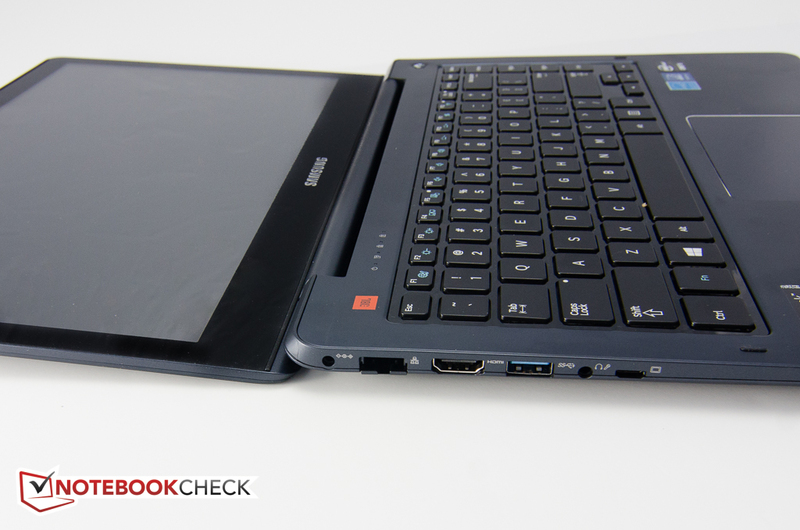 The Lenovo IdeaPad U410 Touch is about 30 nits brighter, the non-touch Toshiba Satellite U940-101 Ultrabook reaches 220 nits. Contrast is disappointing at only 115:1 - even budget models like the 14-inch Acer Aspire V5-431 Notebook achieve at least 150:1. 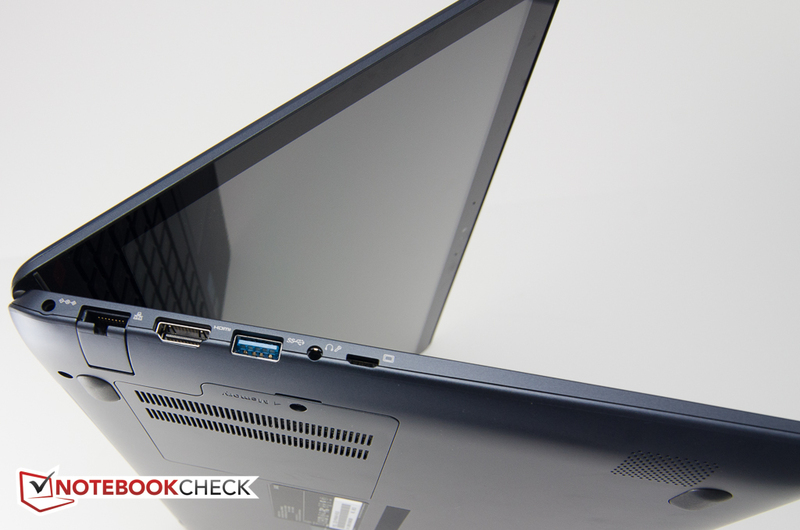 The Lenovo IdeaPad U410 Touch reaches an outstanding 720:1. With a black value of around 1.4 cd/m², blacks are distinctly gray, which makes dark scenes in video clips or movies not very enjoyable. 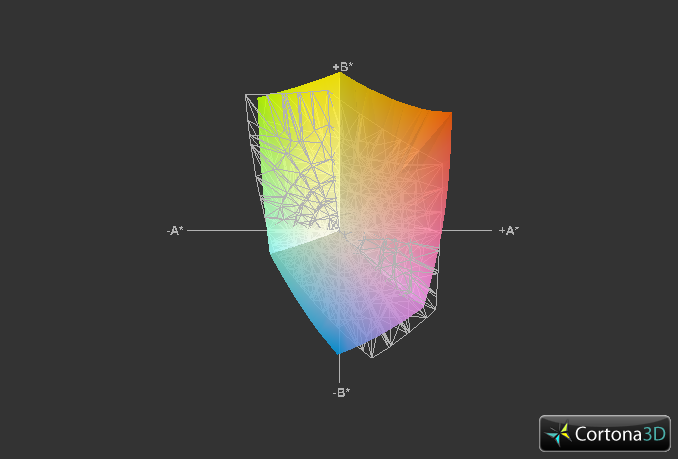 At just under 70 %, the sRGB color space reproduction is in line with other budget display. The IdeaPad U410 Touch falls way short here at only about 40 % coverage, the business-oriented ThinkPad S440 Touch Ultrabook also under-performs at around 60 %. The display of the bargain-basement Asus X401U-BE20602Z Notebook outclasses other budget notebook screens with roughly 80 %. 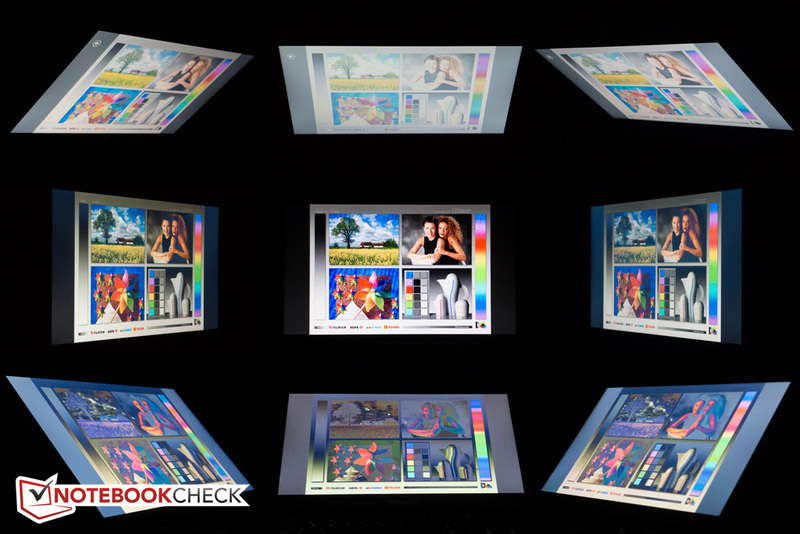 Professional graphics artist need to look elsewhere, but for the average user, color space coverage is certainly sufficient. We then analyzed the color reproduction using the Calman 5 software. As shipped, the display is somewhat cool at 7100K. 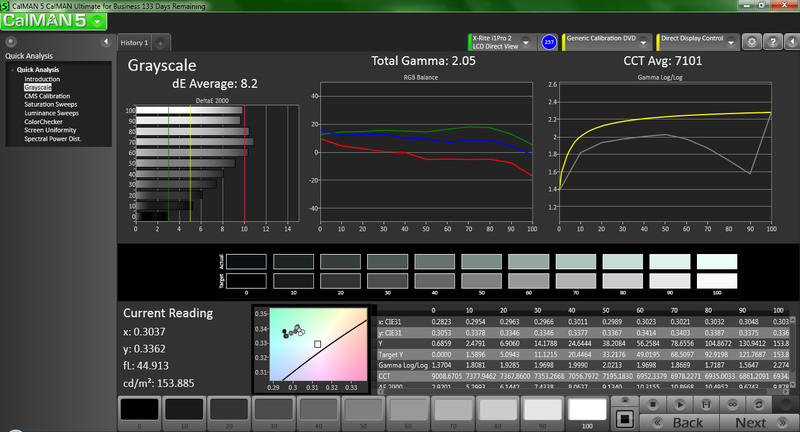 Colors are generally fairly accurate with an average DeltaE of about 7.5 units. 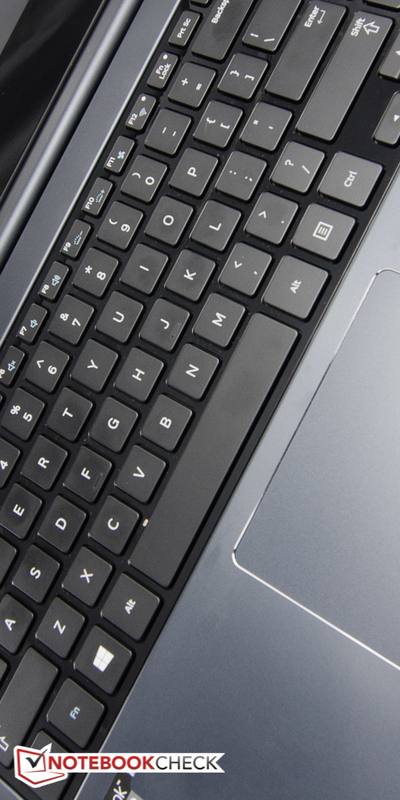 Other budget panels can have values north of 10 - the IdeaPad U410 Touch, for example, surpasses 12. The average DeltaE dropped to less than 6 after calibration and the display exhibits much less of a bluish cast than what we are used to from other budget panels. Considering the target audience, the color accuracy of the screen is certainly satisfying. Although the brightness of the display does not decrease when the Ativ Book 5 is running on battery, the paltry 150 nits combined with the low contrast make for a dismal experience outdoors. Glare and reflections are a constant problem even inside under brightly lit conditions, so we found ourselves constantly adjusting the screen to be able to decipher the content. Viewing angle stability is as expected for a standard TN panel. In the horizontal plane, angles are acceptable, but the screen quickly washes out when viewed from above and colors invert when viewing from below. Since this is a 14-inch notebook, it's rather unlikely that several users will crowd around the display for a movie session - and for a single user, the narrow viewing angles should not pose any problems. The Ivy Bridge Core i5-3337U is a dual-core 1.8 GHz ULV processor specifically designed for low power consumption and low heat generation. This previous-generation processor is built using the 22 nm process and features 3 MB L3 cache. 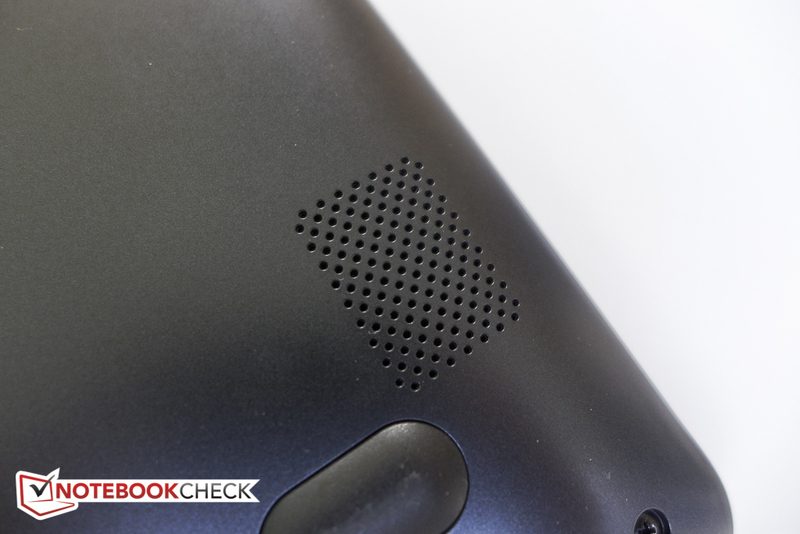 As mentioned earlier, the Ativ Book 5 540U4E doesn't feature a dedicated GPU like the Samsung Series 5 Ultrabook we reviewed in March, so our review model is going to be less ideal for gaming and graphic-intensive tasks. Not much needs to be said about the often reviewed integrated Intel HD 4000, which idles at 350 MHz and can overclock to 1100 MHz when more graphics power is required. For additional information and to check how the HD 4000 compares to other graphics cards, please check out our dedicated GPU page. The Intel Core i5-3337U is a mid-range model with a TDP of 17 watts, which supports both Hyper Threading and Turbo Boost. The 1.8 GHz CPU is capable of overclocking to 2.7 GHz when a single core is active and 2.5 GHz when both cores are active. While the new Haswell processors are slightly faster, Intel predominantly focused on reducing power consumption even further. The actual performance difference might not be that noticeable in practice, so the more cost-effective Ivy Bridge CPUs are still a viable choice amongst various notebook manufacturers. In the multi-core Cinebench R11.5 (64 Bit) benchmark test, the dual core CPU scored 2.49 points. 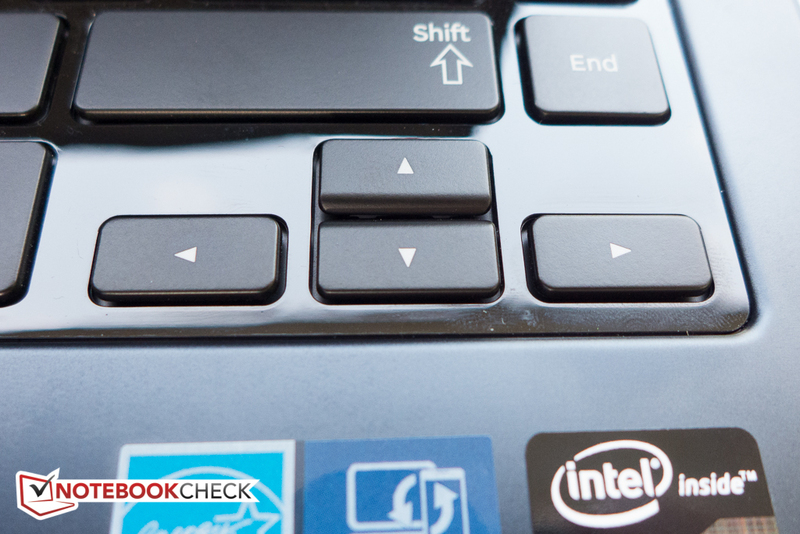 The same processor in the IdeaPad U410 Touch managed an almost identical 2.46 points. The still very popular Core i5-3317U - installed in the Toshiba Satellite U940-101, to name one example - is only marginally slower at 2.4 points. 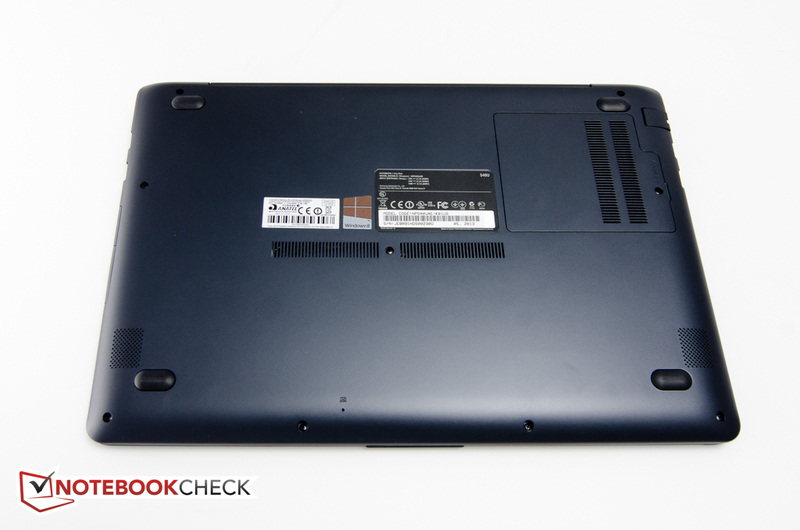 The new Lenovo ThinkPad S440 Touch Ultrabook makes use of a Haswell Intel Core i7-4500U, which is about 10 % faster. The CPU in our review model scored 4609 points during the single-core rendering portion of the Cinebench R10 (64 Bit) test. The IdeaPad U410 Touch is a tad slower with 4587 points, the Intel Core i7-4500U in the S440 is faster by about 25 % (5897 points). While the performance of the mid-level Intel Core i5-3337U might not be sufficient for HD video editing or other CPU-intensive tasks, we did not experience any significant delays due to the processor during our time with the notebook. For more information and CPU benchmarks please check our dedicated CPU page here. 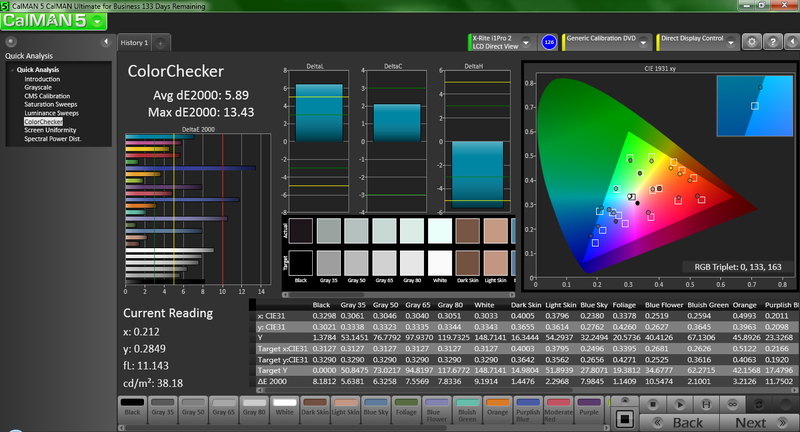 We use PCMark 7 to get an idea of the overall performance. The score of 2534 points is around what we would expect for a notebook equipped with this CPU, singe-channel RAM, and a platter-based hard drive. 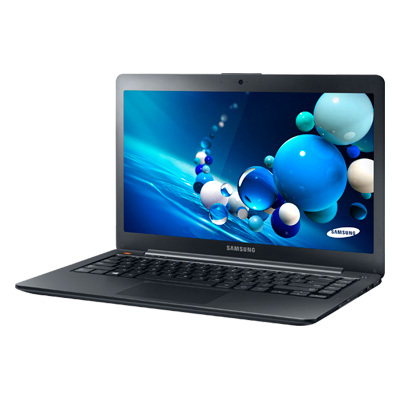 Although the Ativ Book 5 is equipped with a SSD cache drive in addition to the conventional hard drive, a cache drive normally doesn't improve benchmark scores much unless the same exact task is performed repeatedly. A system equipped with a SSD has a significant advantage during this particular benchmark test, as storage plays an important role in the final score. 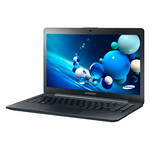 The 15.6-inch Asus VivoBook V551LB-DB71T Ultrabook, for example, uses a conventional hard drive with a more powerful Core i7-4500U and scores 3217 points. 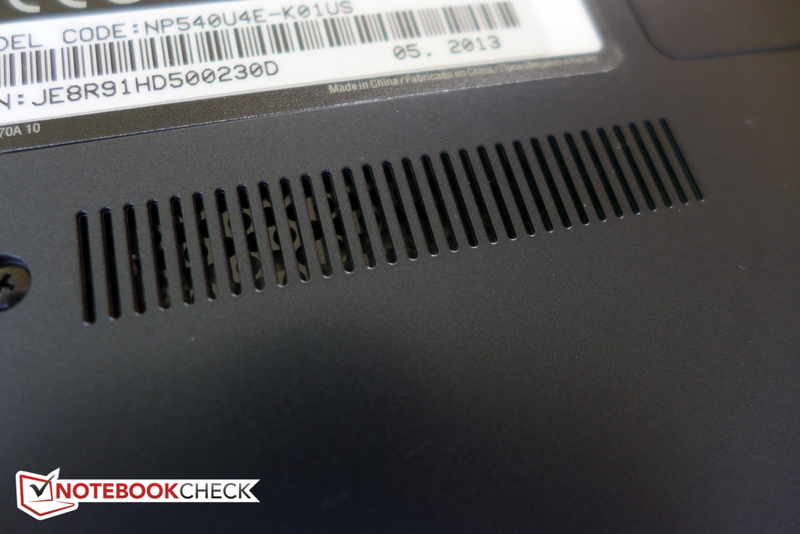 The Lenovo ThinkPad S440 Touch Ultrabook features the same i7-4500 CPU but comes with a SSD - and its score of 4883 points is about 50 % higher. Processing does not take a hit when the Ultrabook is running on battery. 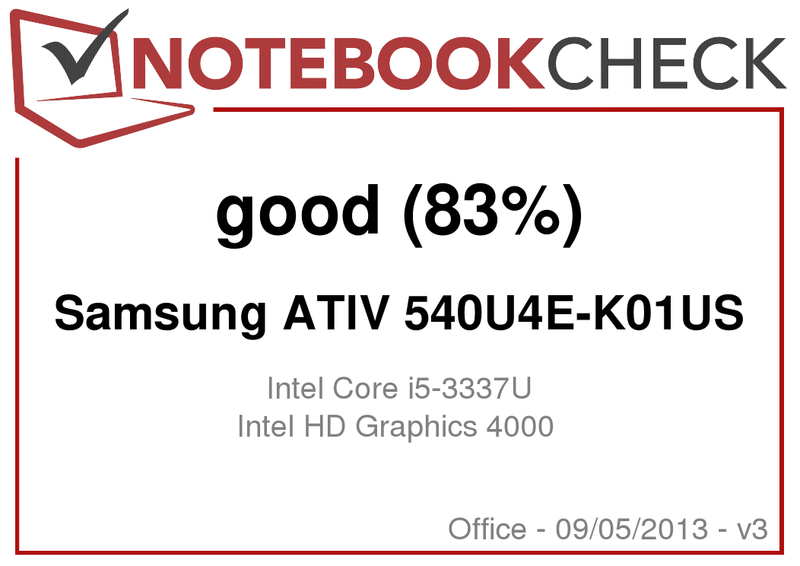 With the high performance profile enabled, the Ativ Book 5 scored within a few percentage points of the score when the notebook was plugged in and close observation with the monitoring tools CPU-Z, GPU-Z, and HWiNFO showed no evidence of the CPU or GPU frequencies dropping. Overall, the notebook handles daily tasks very well and hardly ever feels sluggish. Adding a second memory module so the RAM can operate in dual-channel mode would probably boost performance. The Ativ Book 5 not only contains a Seagate Momentus Thin ST500LT012-9WS142 conventional 5400 RPM hard drive, but also a 24 GB SanDisk i100 SSD. HDTune doesn't attest the combo very good performance: an average transfer rate of under 80 MB/s is quite slow - and so is the access time of 19.1 ms. It's important to realize that a synthetic test like that isn't indicative of normal performance, though - a hybrid drive will store frequently used files in its cache, so the performance of repeated tasks - for example application starts or system boots - will improve sometimes quite significantly after several cycles. The IdeaPad U410 Touch, which uses a Hitachi Travelstar and a 24 GB SanDisk SSD U100 cache drive, offers comparable transfer rates but slightly faster access times of 17.3 ms.
For more information and benchmarks, see our HDD and SSD list here. With only the integrated GPU at its disposal, the Ativ Book 5 Ultrabook runs undemanding games reasonably well, although graphics intensive titles will require a reduction in quality to remain playable. Anno 2070 was still smooth at an acceptable 34 fps at the low resolution of 1024 x 768, but the performance dropped to an underwhelming 18 fps at the native resolution of 1366 x 768 pixels with the settings on medium. The fan is mostly inactive during idle and undemanding tasks. We measured a maximum of 30.5 dB(A), which is barely above the ambient noise level. Under load, we measured a maximum of almost 40 dB(A), which is definitely audible, but still within reason. Since the fan doesn't pulsate and the pitch remains low, we never found the noise disturbing. 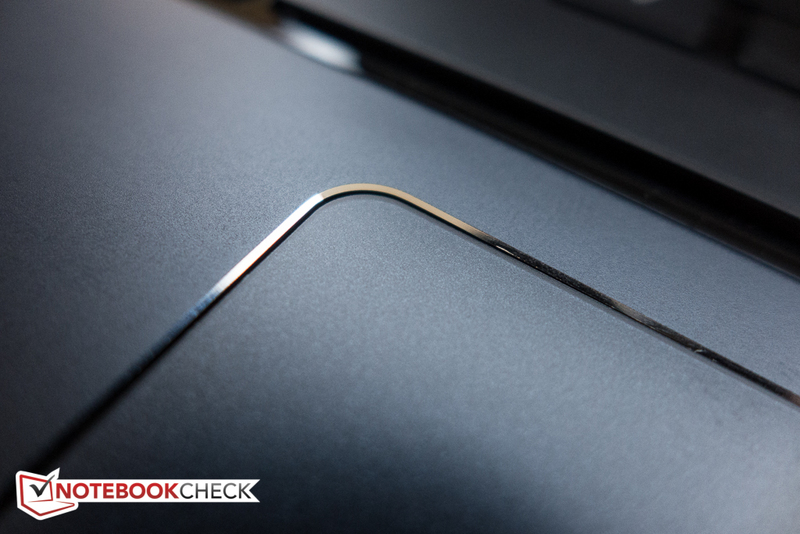 The Ultrabook gets quite warm even during idle: we measured a maximum of almost 39 °C. Since the hotspots are in the middle towards the base of the display both on the top and the bottom, this is not really an issue during use. 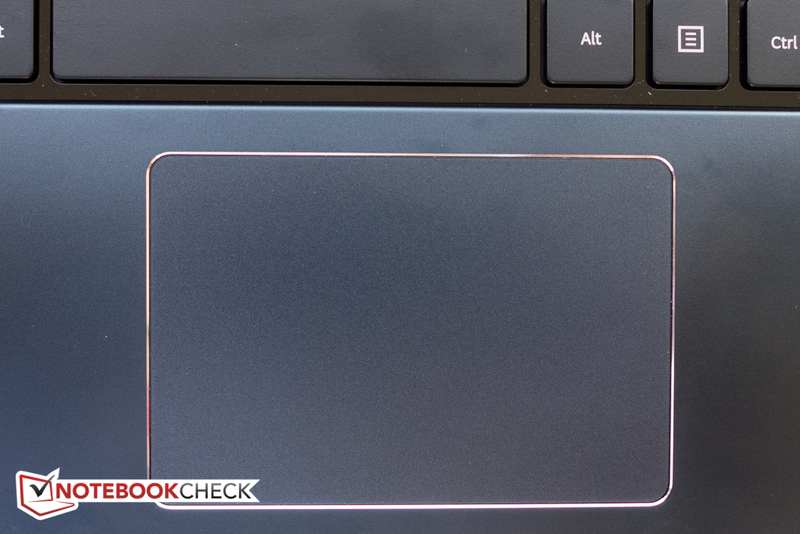 The palm rest to the left and right of the touchpad stayed below 32 °C. 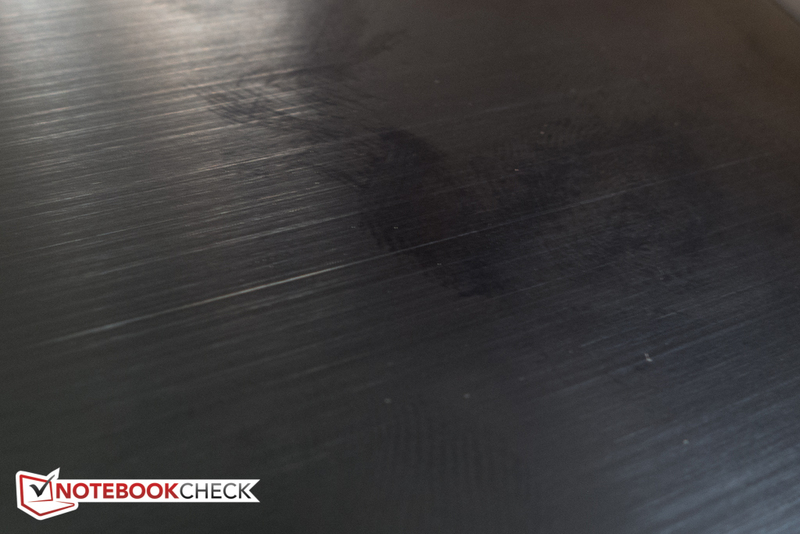 During the stress test, the bottom back of the notebook reached a rather uncomfortable 55.8 °C. 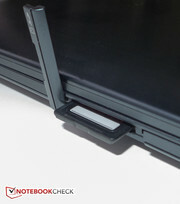 Because of the location of the hotspot, we were still able to work with the Ultrabook on the lap without any discomfort. The palm rest remained quite cool and didn't get any hotter than during idle. (±) The average temperature for the upper side under maximal load is 35.9 °C / 97 F, compared to the average of 29.4 °C / 85 F for the devices in the class Office. (-) The maximum temperature on the upper side is 51.2 °C / 124 F, compared to the average of 33.9 °C / 93 F, ranging from 21.2 to 62.5 °C for the class Office. (±) In idle usage, the average temperature for the upper side is 32.5 °C / 91 F, compared to the device average of 29.4 °C / 85 F.
To simulate a high-stress situation, we use Prime95 and FurMark in parallel and record the results with various monitoring tools. First, we started only Prime95 to stress the CPU and found both cores working at the maximum of 2.5 GHz. With FurMark stressing the GPU on its own, we saw a maximum of 1050-1100/800 MHz (core/memory) with the CPU staying at 1.8 GHz. With both Prime95 and FurMark running, the CPU cores remained at their nominal 1.8 GHz with brief dips to 1.7 GHz, while the GPU stayed at 900 MHz for the duration of the test. The CPU/GPU combo reached a maximum of 85 °C after a prolonged test of two hours. When we re-ran some benchmarks immediately after the stress test, we saw no difference in performance between the notebook heated up and right after a cold start. 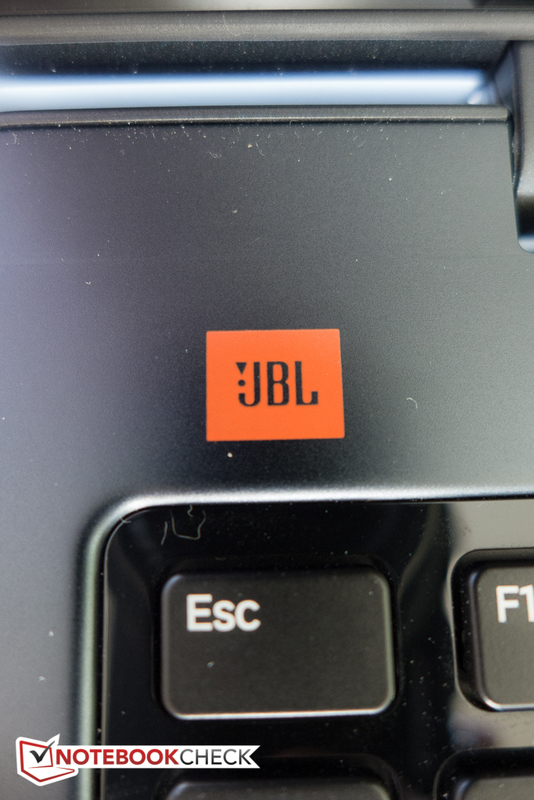 The speakers from sound specialist JBL (part of Harman Kardon) are located a little over an inch back from the bottom front edge on the left and right side and fire downwards. Compared to other Ultrabooks we have recently listened to, the sound is a revelation, as the audio is punchy with good base, solid mids, and pleasant highs. Of course, the user can always connect headphones to the audio combo jack or use external speakers via the same jack or the HDMI port. 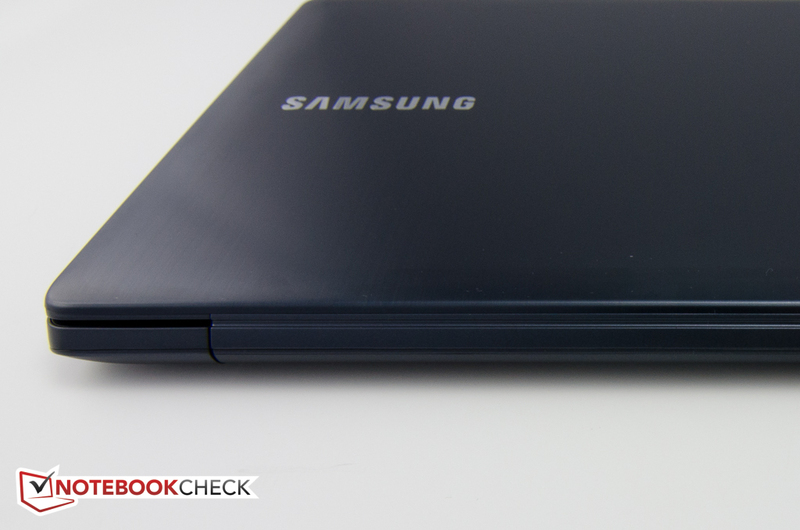 The Ativ Book 5 houses a lithium ion battery with 3780 mAh (57 Wh), which is not user-replaceable. Lenovo's more powerful Thinkpad S440 ships with a smaller 46 Wh battery. For the Reader's test, we chose the minimum display brightness setting and disabled the wireless radios. The Ultrabook lasted for 10 hours and 55 minutes before shutting down. The Thinkpad S440 managed 9 hours and 22 minutes. We simulate a more realistic scenario with our WLAN test. 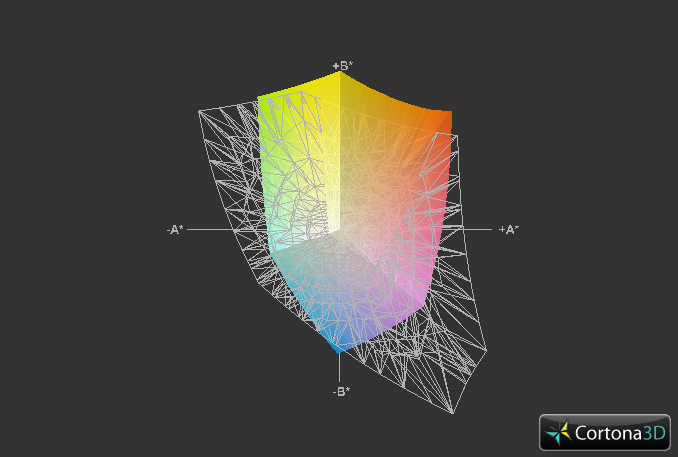 Here, we set the display brightness to around 150 cd/m2 while an automated script visits various websites. The Ativ Book 5 lasted for 5 hours and 17 minutes before we had to plug it back in. The Haswell-equipped ThinkPad S440 Touch Ultrabook lasted just under 4 hours, the non-touch Toshiba Satellite U940-101 Ultrabook, (45 Wh battery) a little over 4 hours, and the IdeaPad U410 Touch about 3 hours and 50 minutes. When we ran the Battery Eater Classic test to determine the minimum runtime, it took about 2 hours 56 minutes before we had to plug the notebook back in. 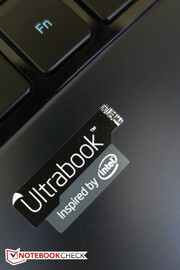 Overall, the battery life is very decent and compares well to other Ultrabooks and slim-and-light systems. 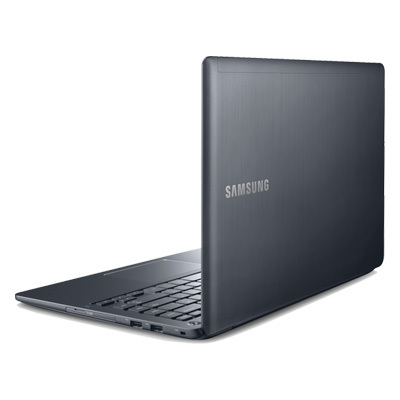 The Samsung Series 5 Ultrabook offers comparable runtimes, although the battery life under load is an hour shorter due to the increased power consumption of the dedicated GPU. 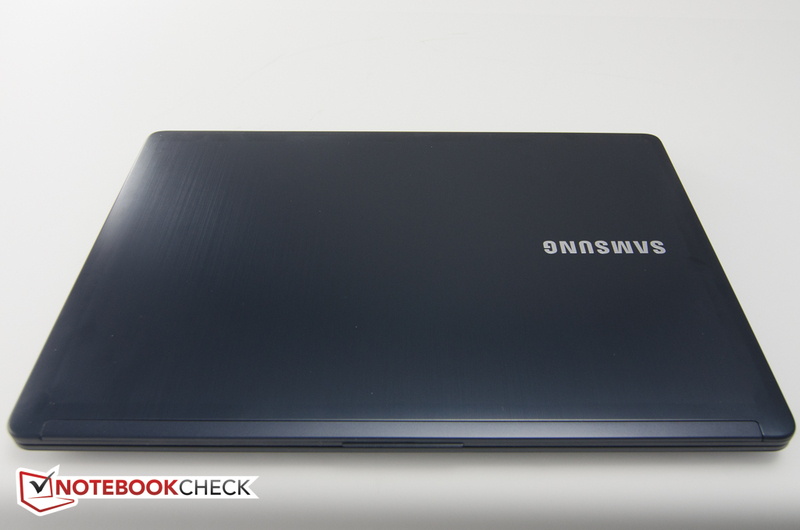 The Samsung ATIV Book 5 is a good choice amongst portable Windows 8 touch-enabled notebooks. The Ultrabook, which currently sells for a street price of around $850, offers decent performance and battery life, and a sturdy aluminum construction paired with good looks. Both the keyboard and the touchpad work well and the audio quality is decidedly above average. The system's Achilles' heel is its highly reflective and very dim display, which restricts outdoor usability. The Ultrabook also gets a bit too hot under load for our liking. 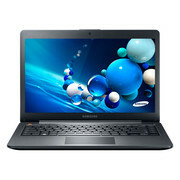 Users wanting to avoid the all-plastic construction of lower-end touchscreen systems but not willing to spend north of $1000 for a high-end, all-metal Ultrabook should be quite happy with the middle-of-the road Samsung Ativ Book 5 540UE4-K01. 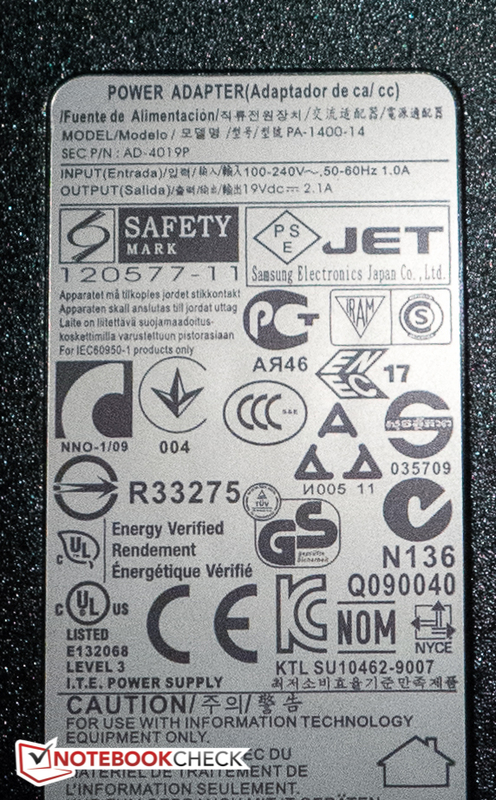 The aluminum surface areas are unfortunately a magnet for finger prints. 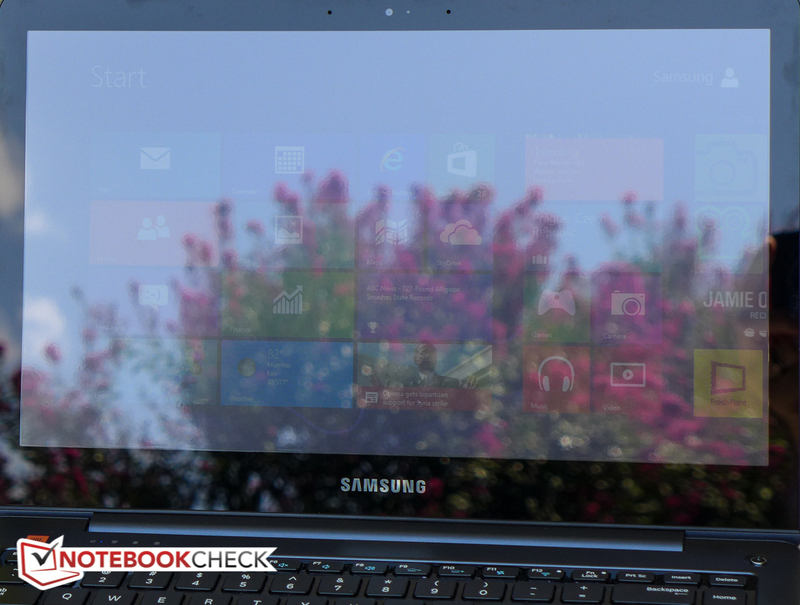 The Ativ Book 5 adheres to Intel's Ultrabook standard. 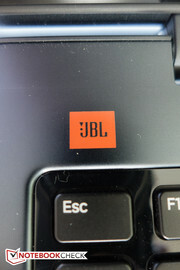 ...and sound very good thanks to JBL components. 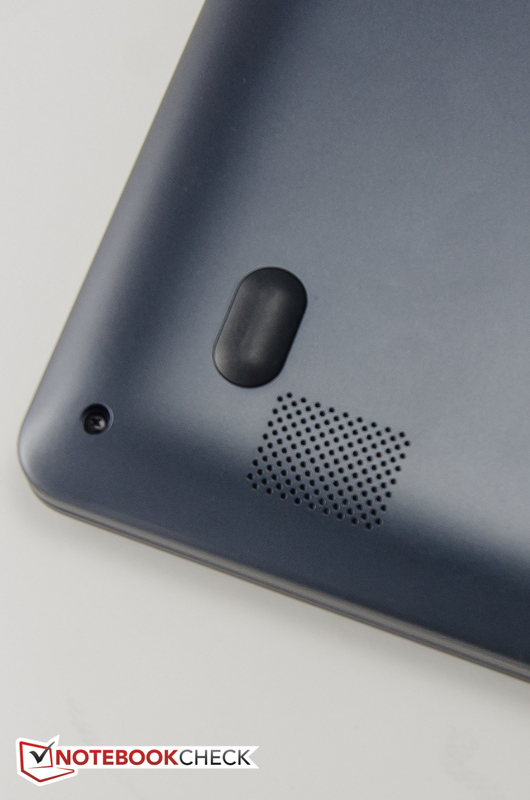 The touchpad is recessed slightly so the edges are easy to feel. One of the two cooling slots in the middle of the underside. The partial cover of the RJ-45 port folds down to make room for the cable. The SD card sticks out; the slot cover needs to be rotated out of the way. 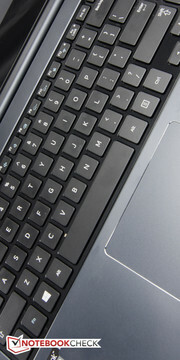 The keyboard provides decent feedback and is easy to type on. The directional keys are only half-size. The maintenance hatch only allows access to the system RAM. Only one slot is open. The power adapter is quite tiny - but we would've liked a modular design better. The adapter supplies 40 watts. These pamphlets are all that's included aside from the notebook and the power adapter. The good looks, build quality, and sturdy construction. A brighter display is on top of our list. The cooling system could be improved a little. That the world's largest manufacturer of LCD displays doesn't use a higher-end display.